The Magdalena radial dike swarm (MRDS) is a large diameter (200- 250 km) radial array of basaltic-andesite dikes of Oligocene age broadly focused on the large volume (7000 km3) Socorro-Magdalena caldera cluster (SMCC) of the central Rio Grande rift. Five large overlapping calderas of the SMCC range in age from 32.5 to 24.7 Ma and show a pattern of migrating to the southwest over a distance of about 80 km during a period of about 8 million years. The MRDS fans through 220° of arc from Pie Town clockwise to Truth or Consequences (TorC). New Ar-Ar age determinations of long mafic dikes at Pie Town, Hickman, Jones Camp and Ft. McRae (Tor C) are analytically equivalent (at 0.4-1.0 % error) to the large volume La Jencia Tuff, which erupted from the Sawmill Canyon caldera at about 29.15 Ma (Chamberlin et al., 2009). Near horizontal magmatic lineations (elongate vesicles) and steeply inclined pahoehoe like folds (perpendicular to flow) observed on the chilled margins of these dikes indicate they propagated laterally as much as 100 km away from the SMCC. Absence of significant contact metamorphism next to most dikes implies they did not reach the Oligocene land surface and did not erupt. In the modern world, seismicity associated with the lateral propagation of non-eruptive dikes would be considered to be “false alarms”. The few dikes that did reach the Oligocene land surface became feeders for basaltic lava flows. Deeply eroded feeder dikes are distinguished by 10-20 m wide contact metamorphic aureoles formed by relatively long term (weeks to months) of heat flow “pumped” into the wall rocks around the volcanic conduit. Photo: Looking southwest along zig-zagging basaltic-andesite dike in the northern Joyita Hills. 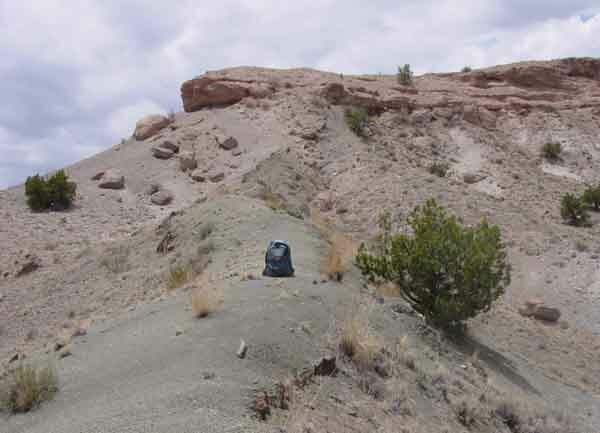 Dike cuts west-tilted sandstone beds of the Spears Formation and is buried by horizontal conglomerate beds of the upper Santa Fe Group that cap the mesa. Field relationships indicate this dike fed a 32-33 Ma basaltic-andesite flow and tephra beds that are well exposed behind the mesa. Based on limited observations of the MRDS, we suggest the length scale of a dike-induced seismic swarm that propagates tens of kilometers (or more) outward from a restless caldera (e.g. Long Valley, 1980) is directly and roughly proportional to the pressure regime and potential eruptible volume of the underlying magmatic system. If this is true, a basaltic dike (and related seismicity) that propagates 100 km (62 miles) outward from a restless caldera would suggest that the underlying magmatic system is under high pressure and relatively large in volume, perhaps capable of producing a caldera-forming eruption (Chamberlin, McIntosh, Dunbar and Dimeo, 2012). Selected references concerning the MRDS and other components of the SMMS are listed below. Chamberlin, R.M., 2009, Primary flow folds on the north margin of the Jones Camp dike: Evidence for easterly dike propagation and mafic magma transport: New Mexico Geological Society Guidebook, 60th Field Conference, Geology of the Chupadera Mesa Region, p.33-35. Dimeo, M. I. 2008, Geology, geochemistry, and geochronology of Oligocene mafic dikes rear Riley, New Mexico, M.S. Thesis, New Mexico Institute of Mining and Technology, Socorro New Mexico, 236p. Dimeo, M.I., and Chamberlin, R.M., 2007, Petrography and Geochemistry of Mafic Dikes near Riley, New Mexico: A Guide to Magmatic Evolution under a Caldera Cluster of the Early Rio Grande rift: New Mexico Geology; v. 29, no. 2, p. 57-58. McIntosh, W. C., Kedzie, L. L., and Sutter, J. F., 1991, Paleomagnetism and 40Ar/39Ar ages of ignimbrites, Mogollon-Datil volcanic field, Southwestern New Mexico: New Mexico Bureau of Mines and Mineral Resources Bulletin 135, 79 p.
Chapin, C. E., 1989, Volcanism along the Socorro accommodation zone, Rio Grande rift, New Mexico; in Chapin, C. E., and Zidek, J. (eds. ), Field excursions to volcanic terranes in the western United States, Volume I—Southern Rocky Mountain region: New Mexico Bureau of Mines and Mineral Resources, Memoir 46, pp. 46–57.